PROG: 147 – DAMIEN, CHILD OF THE FUTURE. Plot: While Rolf Harris is happy with his busy career as a ‘top electronics engineer’ his wife Mary pines for them to start a family. Faced with Rolf’s intransigence she pleads for some compromise and, several years later, Mary is overjoyed by the arrival of her baby Damien. Damien grows up a talented but slightly distanced teenager, one focused, like his father, on designing and building electric gadgets. Damien’s distance and cold nature lead to a row with his mother over having taken and melted down her wedding ring. Eventually Rolf intervenes and takes Damien off to dismantle him. Damien is just a robot built by Rolf. As Damien’s head comes of the robot cries out for his parents to stop. Ending: As the Harris’ sit confronting life without their robot son they are stunned by the head reactivating and informing them that he has improved on his father’s design many times over. A door slides open and simulacra robots of Rolf and Mary appear. The humans realise they are to be dispatched and replaced. Later, as the robot family settle down, Damien suggests to his robot father that they consider doing something about the neighbours next….. Thoughts: A very traditional but thoroughly entertaining sinister Robo-Tale doubtless appealing to the revenge fantasy of many of the then readers. In a series called ‘Robo-Tales‘ it is pretty obvious from the start that Mary’s ‘compromise’ must be a robot; so the revelation, on page three, about Damien having been built isn’t terribly surprising. The story delivers its ‘shock’ with the abandoned robot’s head stating that his ‘parents’ disloyalty will see them replaced by robotic versions of themselves. Children as central characters have been remarkably rare in 2000AD stories and this tale has the honour of being the first one where a child gets around to killing his own kin. Given the amount of death lashed out weekly in the Prog that it took until Prog 147 for parenticide to feature is pretty remarkable. The final touch of suggesting the neighbours will be next gives a nicely sinister coda to the tale. The only real problem with the very traditional art of Mike White is that not only do Rolf and Mary not seem to have aged while Damien grows up but poor Mary seems to have had the same haircut and wardrobe for the whole time. Damien’s lack of school friends was probably down to his shame from having parents who looked a decade out of date. Thrill-Power? : After the left field antics of Ro-Jaws and Hammerstein in the series debut this is much more traditional Future Shock fare. Without ever being top-drawer, the ending and the malicious joy of the young Omen-bot’s triumph over stern adults make it a great kids comic even if they may not have been of the age to recognise that the Damien-bot is the exact spit of the infamous celluloid anti-christ. Shock: Benson makes the sacrifice and the aliens unleash their technology to furnish vast amounts of air on the planet. The PAG representatives reverse their decision to cut funding when they realize the sudden re-oxygenization will make the cost of the program much less. As they depart the planet they scoff that Benson would be delighted as ‘he couldn’t care less about the cost of anything’ Their craft flies off as Benson writhes in pain, enduring the cost he has shouldered for saving the planet he loves. Thoughts: A luxuriant seven pages given to a slightly strange scoff at penny-pinching accountants as opposed to the sacrifice of the idealist. The story has doesn’t have a ‘shock’ per se, more a choice for Benson and a juxtaposed disparaging comment by a PAG member on the final panel. Outside of that the story fails to make a lot of sense. Searching hard one could think of reasons why the aliens just didn’t re-inhabit the planet themselves (since they are able to do it almost instantaneously after Benson’s decision) and why Benson must actually suffer a painful fate rather than be excused after having shown the requisite commitment, but none of it is explained by the story. At seven pages the story-telling is extremely flabby by the standards of 2000AD; Benson isn’t introduced until the bottom of page 2 and by the end of page 4 the tour of the agricultural facilities is just ended. High on tension and drama this tale is not. The art has lots of nice individual panels showing a similar ‘space meets Midwest America’ as seen in Angel Zero and a fantastic panel where Benson steps up to make his choice but for seven pages there is a lot of talking heads and shots of farmland. An interesting Shock in the context of the series, both for page count and political content, and featuring two creators who would go on to work on many more one-shots for the Prog, but overall not a great outing for the series. Shock’d? : The story doesn’t read at all like a Future Shock. The nearest thing to any formal shock is the callous remark of the departing PAG member. It seems more a general small sci-fi tale and perhaps was originally commissioned for something other than Future Shocks. Plot: In 1984, the Prime Minister of the UK celebrates the unveiling of his own Statue with cementing in place a time capsule containing important artifacts of 20th Century culture. Centuries later mankind has passed through a series of wars to emerge in a new ‘Golden Age’ were war is a thing of the past and disease is eradicated. Two archaeologists find the 1984 Capsule and take the unopened box to the ‘Science Centre’ for further investigation. At the Centre this relic from ‘the Dark Ages‘ is immediately deemed to be dangerous and unsuitable for opening. 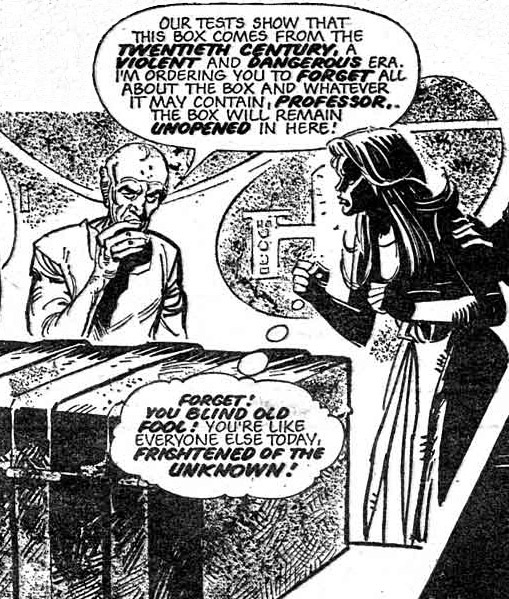 Shock: One of the Archaeologists rebels, she condemns the attitude of refusing to open the box as ‘being frightened of the unknown‘. In secret she opens the box and she and her colleagues marvel at the culture contained within, claiming that ‘There is nothing dangerous about these things‘. However within minutes the time-sealed bacteria has ravaged their bodies and killed them. Thoughts: Mike Cruden repeats the ‘gruesome’ final panel trick of FS 43 hinting that the astounding rotting corpse by Belardinelli had been a big hit with the readers. Mike White, best known as the artist of Alan Moore’s Abelard Snazz, turns in a nicely horrific pair of decayed bodies in a final panel which is much the best element of the tale. His first work for 2000AD is marred only by poor layout on the first page that necessitates horrible direction arrows to guide the reader’s eye. Otherwise the strip is well drawn if in a slightly dated orthodox ‘boys comic’ style. Cruden’s strip falls into his series of ‘adults suffering horrific fates’ and while the War Of The World lesson may be clichéd to an adult it probably was pretty eye-opening to a young reader. The strip uses two and a half pages to cram in a lot of elements, from the counter-factual British Prime Minister to the final opening of the capsule and death. Chosing to introduce the main characters on page two is a brave move, leaving page one to be packed full of the alternate history detail but suffering perhaps from a lack of time to establish any character in the various protagonists. Indeed it is only in the fourth panel of the second page that we learn our main protagonist is not only an archaeologist but a very young very pretty Professor. Up until that point the two scientists doing field work resemble more a curious courting couple in a forest, not least because one is seen strumming a Lyre. Maybe it is some sort of high-tech future archaeological kit that just happens to look like a Lyre. Given this lack of characters to invest in, the strip simply turns on the success of the idea and in the context of 1978’s 2000AD it may not be original but it is effectively deployed by the image of the rotting corpses. Shock’d? : The idea of bacteria from the past / another world destroying an entire species is, of course, a rather well trodden trope in Science Fiction; however for any young reader not yet exposed to it this is a fine little rehash. The Shock is one of the ‘final panel reveals’ that work so well in comics and Mike White’s drawing does the story proud.